Marshalltown High School students Sydney Grewell and Nate Harris presented information on Homecoming week, which is underway at MHS. For more information on Homecoming week, click here. MHS students Sydney Grewell, left, and Nate Harris spoke to the board about Homecoming week. Mary Giese of the Marshalltown Public Art Committee (M-PAC) talked about a grant they received for a significant art piece for the Roundhouse from Iowa Great Places. A total of $100,000 is designated for a piece of art and $125,000 for enhancements such as light poles, banners and seating. Both are paid for through the grant. Proposals for artists for the project are expected to draw interest from around the country. Construction completion and installation of the art piece is expected by Jan. 1, 2017. This piece will be on loan to the Marshalltown Community School District. The board approved the proposed Request for Qualifications. Tom Swartz presented information on the Iowa Youth Caucus, which will be Nov. 19 at Marshalltown Community College. Both political parties will be there to show what caucus night is like so youth can be educated on the process. Anson Principal Ronnie Manis, along with school staff members Kim Hurley, Jennifer Estabrook and Jennifer Janssen presented the school’s Attendance Center plan to the board. Anson serves 350 students in the district. Manis said they have four focus areas this school year including Instructional model (Sheltered Instruction), Math, Language Literacy Framework and increasing parent involvement. Associate Superintendent Dr. Susan Pecinovsky presented on the ACT scores. “We have showed gains across the board and with our composite score, Pecinovsky said. The number of students taking test showed a decline and the district is looking at ways to increase participation. For more details on the ACT scores click here. Pecinovsky presented information on this. From the district perspective, the Annual Yearly Progress was missedin reading and math, with the benchmark being 100 percent of students being proficient. Pecinovsky said there has been growth in the numbers but there is still work to do. Board approved nomination of David Giese as our director to the AEA 267 Board of Directors. Changes the Miller Middle School handbook were presented by Director of Human Resources Lisa Koester. The changes dealt with a selection of classes that earn high school credit at Miller. The board approved the changes. – Appointed Brian Bartz and secretary/treasurer for the district. – Appointed Cartwright Druker & Ryden as school’s attorney. – Appointed Ahlers & Cooney PC as additional legal counsel for selected legal issues. – Appointed TSP as architect of record. The board approved the financials institutions eligible to receive public funds and the maximum amount that can be kept in these institutions. Brian Bartz gave the certified annual report. “The district is in good financial shape moving forward,” Bartz said. 502.7 Student Conduct in Extra-Curricular Activities – Approved as amended- waived second reading. 603.6 – Instructional materials selection – Changes to be made – will be brought back for first reading. Andrew Potter reminded the board of the community feedback meeting at 5:30 p.m. Tuesday, Sept. 29 at the MHS library. New board members are cheered on after being sworn in. Bartz presented an abstract of votes and noted the four new members who were elected as a result of the Sept. 8 election. Bartz then gave the oath of office to the new board members including Janelle Carter, Ross Harris, Sean Heitmann and Ben Stansberry. After being sworn in, the board elected Bea Niblock as president and Janelle Carter as vice president. Niblock thanked the outgoing board members for their service. She also said she was appreciative, humbled and honored to be chosen to lead the board. 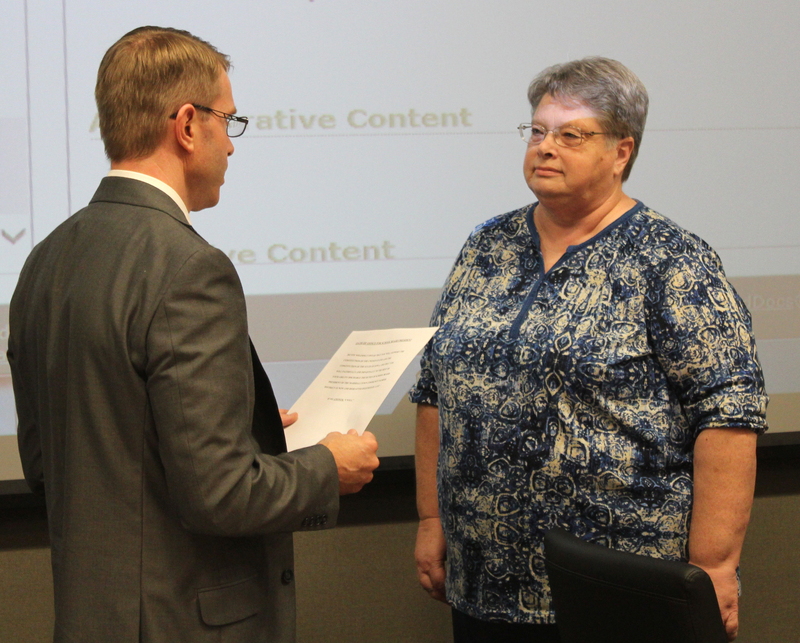 Brian Bartz swears in new Board President Bea Niblock.